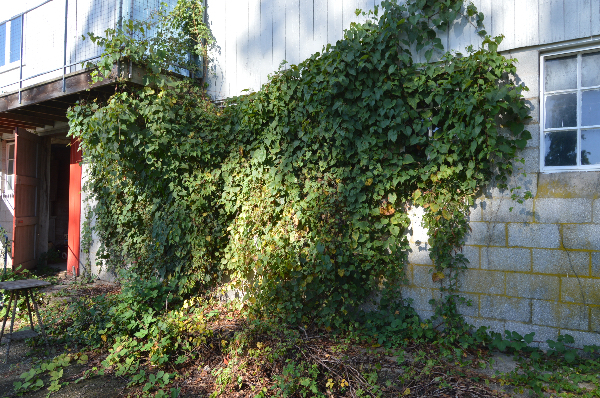 We bought Good Contrivance Farm, in part, because it hadn’t been touched since 1959. The farm house was like a time capsule. 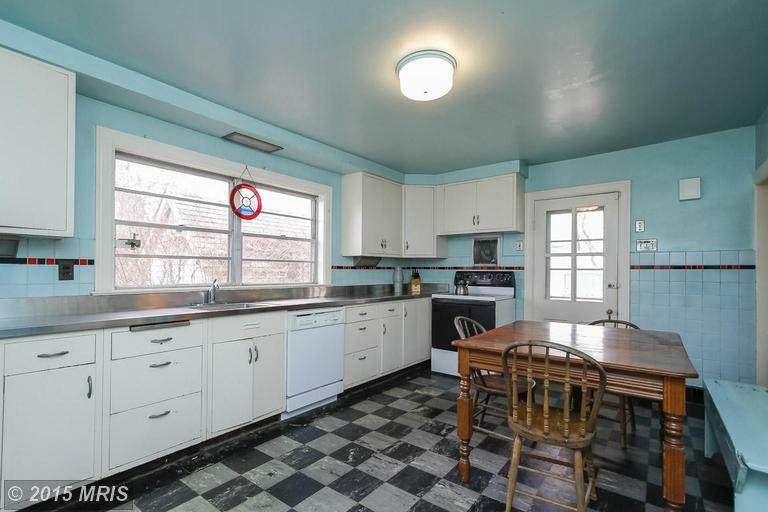 The kitchen was state-of-the-art circa 1960, as was the upstairs bathroom. The rest of the house was pretty much original, circa 1900. 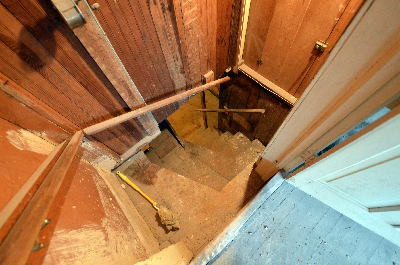 We figure the house was originally built about 1880, then updated in the early 1900s. The 1959 upgrade was the last. That means we have lots to work with. 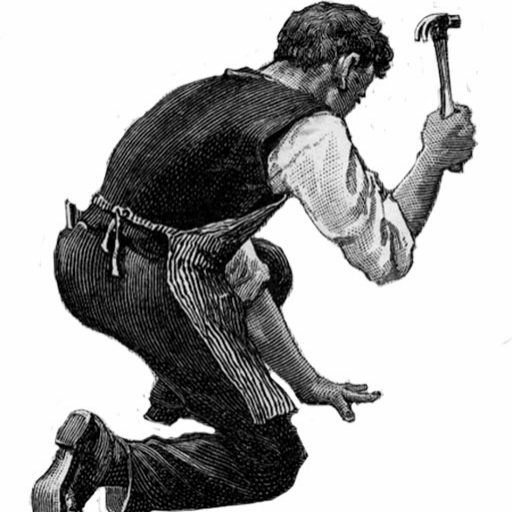 Our aim is to bring the house back to about 1900 — with some significant exceptions. Our first year, we were working mostly with the land. The fields were overgrown, vines were spreading over the buildings, the trees were hunkered down–burdened by branches that had never been trimmed, the water lines that used to run throughout the farm were dead, rotted stumps and logs littered the land, rampant plantlife was everywhere. The previous owner had said she let the land “go natural.” It certainly seemed plenty “natural,” almost a wilderness. And there were clearly some instances of neglect. The front yard, for example, was crowded with boxwoods that had never been trained (properly pruned): as a result, they were huge and totally obscured the view to and from the house. This was most unfortunate. I like boxwoods. But, once a bush like that is grown out, there’s no cutting it back (there would be no leaves). So I had to take them out. 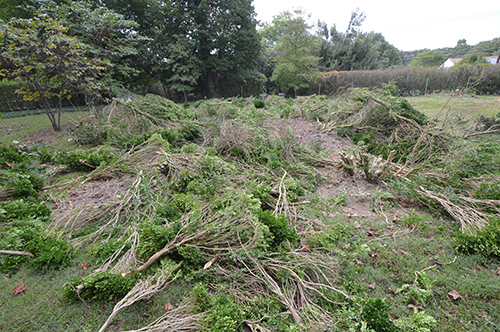 I called it the “boxwood massacre.” The lesson here is simple: unless you live in the wilderness, there is no such thing as letting your plants and trees go “natural.” Our plants and trees are cultivated–i.e., domesticated, like our pets, poultry, and livestock. They need our attention and nurture. To achieve full health, trees and bushes must be pruned. Some bushes and trees were simply too old to save. We removed a few. Others were so overgrown, it took me the better part of a day to tend to each one. I imagine they breathed a sigh of relief when we unburdened them. 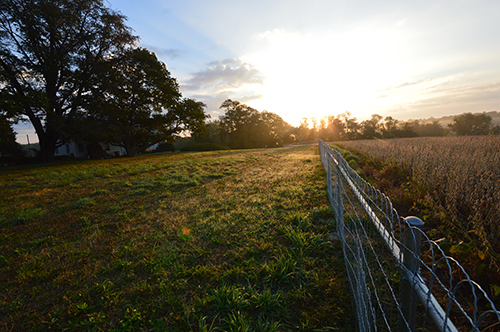 After we got the grounds sort of under control, we fenced in our property: 2,000 feet of galvanized four-foot-high fencing. 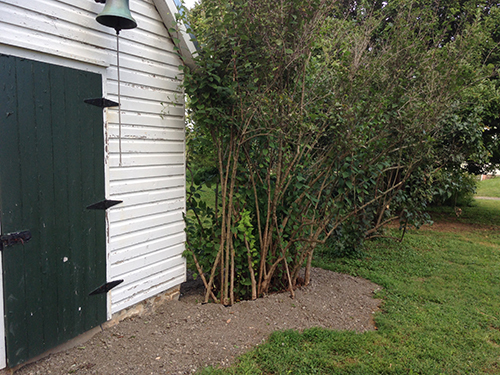 We needed this to keep the animals in and to discourage unwanted animals (deer) from coming in. Now, I know what you’re thinking: no way is a 4-foot fence going to keep deer out. But it did; and it does. It’s just enough trouble to keep the deer at a distance. I guess I should mention that we have dogs roaming the property. You think that helps too? 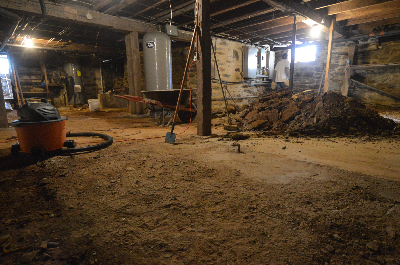 The first challenge was to clean out, clean up, and fix up the basement, which flooded every time it rained. It was a dark, musty, dungeon full of snakes. Yes, snakes. Black snakes. They came for the mice. The snakes were so bad, they started oozing out of the stone foundation when we tamped the dirt floor in preparation for new concrete. So we had to fill in all of the holes — hundreds of them — in the foundation. 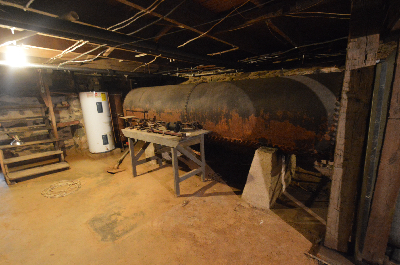 The basement held a 1,000 water tank, which had been installed circa 1890 to hold water pumped from the well via a big windmill. When there was no wind, there was no pumping; hence, the storage tank. We had a guy demo the water tank and scrap it for salvage. He did the same with two 100-gallon oil tanks. We also got rid of the 1950’s furnace, the old water heater, the old washer and dryer. 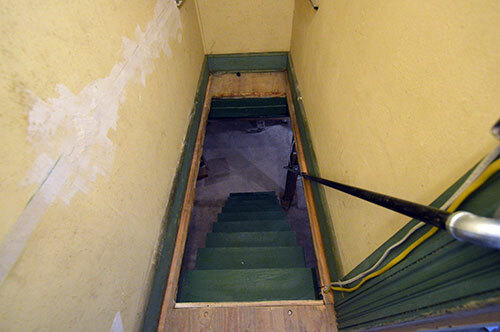 We poured new concrete over the original dirt floor, then ran new electricity, sealed the leaky walls, restored the historic shelving, and built a new stairway into the basement — because the old stairway was an impossibly steep hatchway. 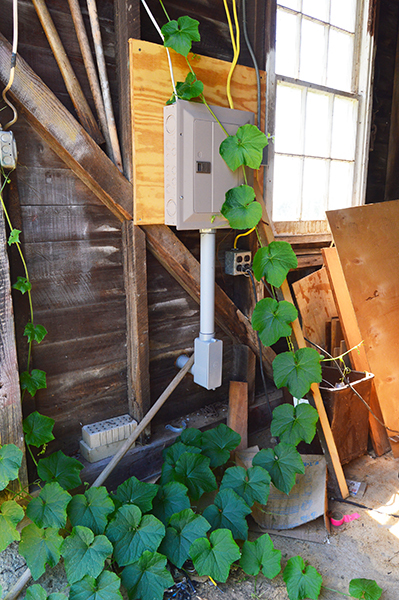 We discovered that, even though the 200 amp electrical service in the basement was fairly recent, that panel was tied into just 3 lines that serviced the entire house. Those lines were “knob and tube” wiring, circa 1920. So, running new electrical lines was a huge job and a top priority. 2) Roof: Our old farm house had a roof that was at least 20 years old. We knew that originally it had, or should have had, a raised-seam metal roof. So that’s what we got, installed with historic accuracy by Craig Harkin, who specializes in metal roofs. All of the roofs on our outbuildings are raised-seam metal. 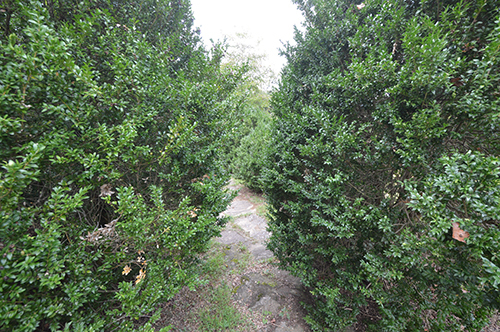 3) Front yard: our front yard was crowded with 115-year-old boxwood bushes. Ten of them. They were so gigantic (had never been trimmed properly) they completely obscured the view of the house. You’re supposed to sculpt boxwoods and keep them down, unless you’re building a maze made of bushes. I did not undertake the boxwood removal lightly. That is, I felt bad about taking out these old bushes (the boxwood massacre, I called it). But there was no alternative. 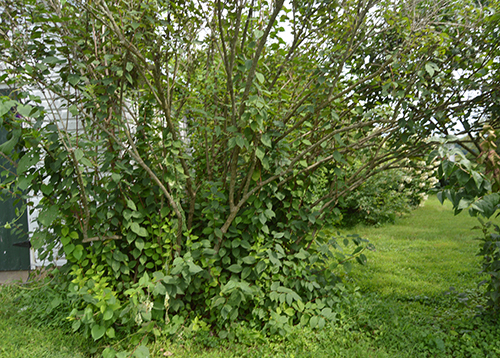 They couldn’t be trimmed down because they had been allowed to grow wild, meaning they were green only on the outermost layer–everything underneath was just naked branches.